Home > Mare's Musings > Triple Crown Season II: Bobbi Patscheider, RIP. Arabian Racing–and Thoroughbred Racing–Lose a Friend. Triple Crown Season II: Bobbi Patscheider, RIP. Arabian Racing–and Thoroughbred Racing–Lose a Friend. I have absolutely nothing to contribute to Preakness-themed conversations, except for my rant here a few days ago about sexism in American horse racing. So what shall I write today? On Thursday morning, a great woman in horse racing died. 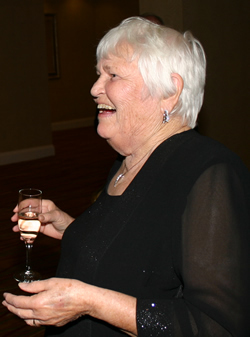 Bobbi Patscheider, Editor of Arabian Finish Line magazine, passed from this world to the next. I received an email from the Texas Arabian Breeders’ Association last evening. A very sad announcement, that Bobbi had died. TABA wrote some beautiful, true words about the good and great woman. I cried as I read and remembered. I cried for her husband, Don. I cannot begin to imagine how he’s feeling. I cried for all her friends and colleagues in Arabian horse racing. Bobbi is much-beloved in that wonderful community of horse-loving professionals. 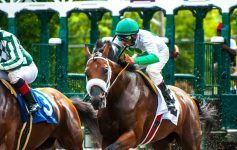 So Thoroughbred racing organizations in the U.S. finally are coming around, and seeing that Arabian racing not only is valuable–but acknowledging also that hosting Arabian races on their Thoroughbred tracks is a way to show newbies that there’s a long-standing connection between the two breeds. I cried also for the readers and fans of Arabian Finish Line. Bobbi’s husband, Don, is President of Arabian Racing Publishing Company–but of course, he’s grieving at the moment that I write this. I’m sure that the magazine will carry on, but it’ll be hard to find someone with all that Bobbi brought to the table. Arabian racing was her passion–her magazine provides carefully-collected stats, events, articles. Some pretty big horseshoes to fill there. And then, selfishly enough, I cried for myself. I wish I could say that I knew her well–but that’s why I’m crying for myself. I’m sad–so profoundly sad–that I did not know Bobbi better. I met Bobbi and Don three years ago this July, at Delaware Park. I was there for the same reason as they: to witness the HH Sheikh Mansoor Bin Zayed Al Nahyan Global Arabian Flat Racing Festival. I’d never seen Arabians race live, and I was champin’ at the bit. Like a kid in a candy store. I think I bounced all weekend long. Immediately, I loved both the Patscheiders. A wonderful couple–Bobbi was kind, generous and took me in as if I was family. But she wasn’t some little old lady who’s naive and so sweet that my teeth rotted just by shaking her hand. She was savvy, wise, funny as all get-out. And Don was equally funny, and amused. I wrote for Arabian Finish Line several times since that first meeting, but sort-of stopped because I felt that I had nothing more to contribute. My column was about my observations as a newbie to the sport–as a Thoroughbred fan who’d discovered the beauty, the joy of the Arabian horse as a race horse. I’m sure that readers were sick of me waxing on in every article. No, let me tell you why I’m crying for myself. I’m crying because it’s Preakness Day–and without Arabians, there’d BE no Preakness–and that Bobbi Patscheider knew more about Arabian horses than I’ll ever know. Even if I gave up my obsession with Thoroughbreds this very moment, and did noting but study Arabians and the sport for the next 10 years–I’d never have her body of knowledge. I wanted to learn at her knee,. I kept saying that I should give her a call–I’d loved our phone conversations, our emails. I missed her voice. I missed her laugh, and her consternation over certain topics. Talking with Bobbi always rejuvenated me, one way or another. Never ignore that little voice that tells you to call someone. If you miss them, pick up the phone. I miss her, and yet I knew but one facet of her. I didn’t know her favorite color. I didn’t know her favorite food, or her birthday. I don’t know where she was born–where she went to college–even if she had any pets. I can’t find her obit online, so I can’t fill in any of those blanks. I knew her strictly through her passion for Arabian horses, and the magnificent sport of racing them. That may sound pathetic–to love and miss someone whose blood type you don’t know. In this 21st Century, because of technology and social media, we can know the most intimate details of, say, Facebook friends. Details we don’t need to know. “TMI”–“Too Much Information,” as they say. I don’t care if a Facebook friend hates her husband. That is not the sort of info that should be shared with every single human on Planet Earth, and the Martians who listen in. So I can know intimacies about 2,000 strangers–but so many things I did not know about this woman whom I consider a friend. But the sad Truth to this story is that I don’t need to know if she loves cats or hates the Yankees or went to College X. Bobbi Patscheider and I shared an obsessive love for horses. A love that transcends time and space. A love that, as you horse-loving readers know–makes everything else fade into the background. Shared love for Arabian horses was enough for Bobbi Patscheider and me. In that sense, our friendship was its perfect self. You readers who don’t-yet know Arabian racing–I hope you discover the sport. I want to see Thoroughbred racing meet Arabian racing, perhaps in a summit. Let’s move forward together. I’ll never stop loving Thoroughbreds–but I owe so much of my passion for Arabians to Bobbi Patscheider, one of the greatest, most ardent horse racing professionals ever to grace a track. God rest your soul, Bobbi, and comfort Don, your family and everyone in Arabian racing. May the Horse be with you, all. Photo of Bobbi Patscheider, courtesy of Texas Arabian Breeders’ Association. Previous Article Triple Crown Season 2014: Didja Ever Love a Horse…?